A great city like London never has a single, fixed identity. There is the London of Charles Dickens; there is the London of Edgar Allan Poe; there is the London of Arthur Conan Doyle. Each is different and each is distinctive. I present my own version of the city in my novels, but (re)creating it means straddling the gulf between past and present. I take my research very seriously. That means reading the daily newspapers of the 1840s and leafing through books whose brittle pages carry almost two centuries of dust. It also means spending time on the same streets where my stories take place--streets that are often the same now as they were 160 years ago. Amid the noise and light of modernity, there are ghosts of memory. He is a street cleaner, pushing his cart and carrying a broom just like the boy street sweepers of Dickens’ day. His face is twisted and burned, the skin seemingly melted into swirls of pink-and-white scar tissue. Is he a war veteran? Are these the injuries of childhood? There’s not another person to be seen in this metropolis of seven million people and I have to wonder: Is he a spirit? Then I realize that my 1850 map tells me only half the story. Fleet Street may be the same, but Holywell Street has been completely obliterated by time. A whole city block has been built over it and the small streets that once ran parallel to it. Now, the vast edifice of Australia House sits on the land. The location of my story exists only in documents and imagination. It’s a sobering thought. People lived on Holywell Street. They worked there, fell in love there, gave birth and died there for centuries. Books were printed there. Stories about it appeared in newspapers. And now it’s gone. There is not a single living person who can recall a memory of its existence. Only in books and stories does it remain: just versions and interpretations of the truth. 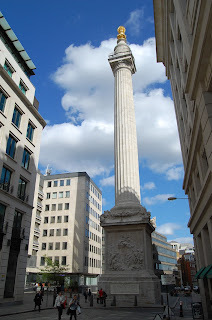 Next, I walk eastwards to visit the Monument: that towering column built by Sir Christopher Wren in 1677 to commemorate the Great Fire of 1666. Amazingly, the structure remains. At 202 feet (61.57 meters), it used to be one of the tallest structures in the Victorian city, but it is now lost among the office blocks. Even when you know it’s there, it appears as a surprise in its small courtyard. (Left) Wren’s Monument, located where London’s Great Fire of 1666 began. It looks graceful on a clear day. The stone has been cleaned recently and you might not guess it has stood through two world wars. When its first paying visitors stood on the viewing platform, huge areas of the world map were still blank. Continents stood empty and the Pacific Ocean was largely white space. But the Monument is virtually unchanged since 1677. You can still pay your money and ascend the 345 black marble stairs upwards and upwards into the narrowing spiral until your calves ache and your thighs plead for mercy. How many others have walked these steps? How many of them were famous? Herman Melville was in London. Benjamin Franklin. Conan Doyle. Edgar Allan Poe. Countless visitors to the world’s biggest city. Did they walk these same steps? And yet, as I walk, I know something that most other visitors do not. Six people never returned down these stairs. Six people walked slowly to the top with one blinding intention--to leap from the top. Six people have jumped from the Monument. Stand at the top and look down through the security netting and you will understand: they did not survive. Their bodies were smashed. Imagine, as I have done, how they felt as they stood on that same stone shelf and looked out onto the broad brown ribbon of the Thames. The air would have been thick with coal smoke. Other visitors would have been talking. No amount of reading can create the same impression as standing in the footsteps of your characters. I see things differently when I visit London. I see the numberless nameless souls who have perished there across the centuries through crime, accident, and suicide. 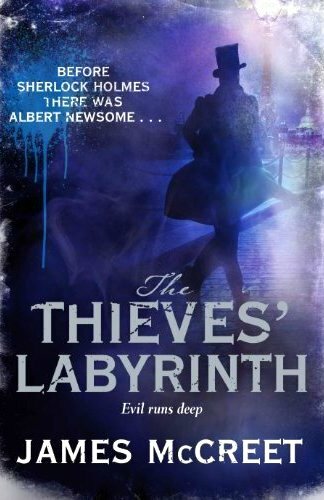 My new book, The Thieves’ Labyrinth, is based around the river Thames: London’s most enduring and unchanging feature. Go there at low tide and you will see the mud banks that used to be populated by the poor, picking through slime for pieces of coal, rope, and copper. Even today, you can find clay pipes from the 17th century, pieces of Delft pottery from the 18th century, and semi-fossilized animal bones washed up and down the river since employees of 19th-century slaughterhouses threw all of their waste there. The whole history of the city remains beneath the Thames’ dirty waves. I had a strange experience while checking details for my first book. 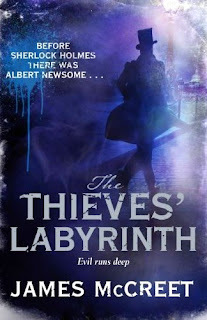 There used to be a jail on Giltspur Street near old Smithfield Market, and one of my characters had been imprisoned in it. The historical records had told me that the isolation cells looked out westwards onto the street, and I wanted to take in that same perspective. What had my character seen as he looked through the bars? And as I stood there appreciating a view that has not changed in centuries, I had the strange sensation of feeling myself in my own story--feeling myself as my character, former criminal Noah Dyson, holding the cold iron and seeing the same church, the same street. Not only was I suddenly inhabiting a moment of history, I was inhabiting a fictional reality I myself had created. I see London differently. I see streets that have vanished, bodies that once lay bloodied, steps once trodden by historic figures, and story lines that are constantly being told and retold. This is the London of my books. Welcome. Sounds a great. Now on my Good Reads list. Really enjoyed that tour.